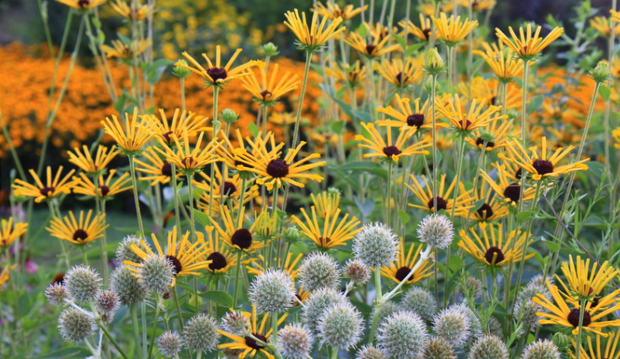 Many gardeners are familiar with golden coneflowers such as Rudbeckia fulgida ‘Goldsturm,’ seen blooming en masse in the background of this image. But “reliable, long blooming, and unique” are just a few key words that come to mind when I think of this not-so-commonly known variety. 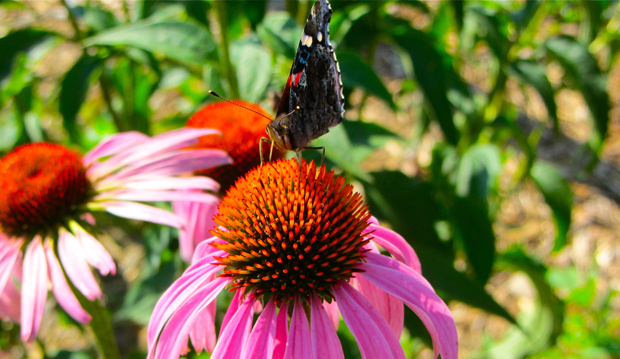 Rudbeckia subtomentosa ‘Henry Eilers’ is a sun-loving perennial that grows 4.5- to 5.5-feet tall, and produces a mass of quilled flowers from midsummer to fall. The plant may stand alone as a specimen in the garden , or can combined with other summer bloomers to add some textural contrast, as seen here with Eryngium yuccafolium in the perennial border. R. subtomentosa ‘Henry Eilers’ also combines beautifully with ornamental grasses and make a great cut flower for indoor bouquets.